The Football Ferns put in a strong showing to completely dominate proceedings in the opening game of their two-match Thailand tour but were unable to find the goal their efforts deserved and had to settle for a scoreless stalemate. 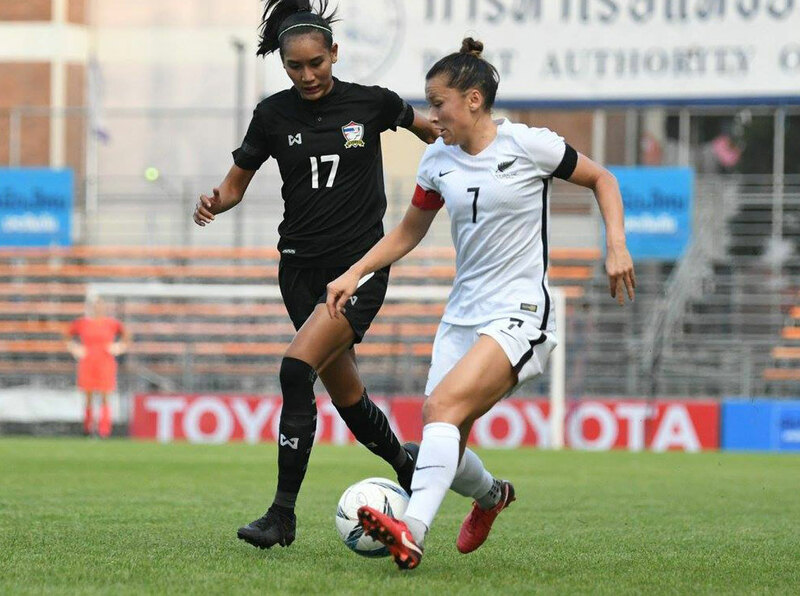 A small yet boisterous crowd had gathered at PAT Stadium in Bangkok but had little to cheer as Thailand struggled to break down a well-organised New Zealand defence. Instead it was the visitors who had the better of the contest, enjoying the majority of possession and carving out several opportunities to score. The best of these fell to Amber Hearn – who was not available for the USA tour in September – but she was denied by either the offside flag or the Thai goalkeeper on a frustrating evening for the top goal scorer in the history of New Zealand football. Interim co-coaches Gareth Turnbull and Andreas Heraf made a couple of tactical and personnel tweaks to the USA tour with CJ Bott coming in at right fullback and Ria Percival – the majority of whose 127 caps have come at fullback – moving into a holding midfield role alongside Katie Bowen. The returning Hearn was partnered by Hannah Wilkinson up front while Olivia Chance was given an opportunity to impress on the right flank. With Bowen often dropping deep to pick up possession and the fullbacks bombing forward, New Zealand took hold of the contest from the early stages but clear-cut chances proved hard to come by. Hearn fired off the first shot on goal in the 12th minute but was a long way out and couldn’t find the power to beat the goalkeeper. She came even closer eight minutes later, getting on the end of a pass from Annalie Longo and appearing to turn it home but seeing her effort ruled out by the referee. Soon after, a Chance corner dropped just behind Wilkinson and she swivelled to hit it on the turn but her volley was blocked. Just after the half hour, New Zealand again threatened to score when Percival joined Hearn in trying her luck from distance, rifling a strike narrowly wide of the top corner after a cross from skipper Ali Riley was only partially cleared. Percival then turned provider to pick out Hearn in the box and she scooped her effort over the bar but the flag was again raised anyway. Not long after the break, the best opportunity of the match arrived when a well-worked free kick routine allowed Chance to cross for Hearn, who couldn’t put her header past the goalkeeper. Hearn had another crack from a long way out around the hour mark but her attempt bounced wide and it began to look as if the goalscoring gods would not be smiling on New Zealand tonight. Stephanie Skilton had come on for Wilkinson at half-time and two further changes were made in search of a goal, Hannah Blake and Katie Rood both entering the fray later in the second half. It was a proud moment for Blake, just 17, as she was making her Football Ferns debut and was joined in doing so by Elise Mamanu-Gray late on. In stoppage time, Skilton had half a chance to score a dramatic winner when played into the box but she was at a tight angle and was denied by a good save. “The performance of the girls was really good and they did everything to win this game,” Heraf said. “A problem of the team in the last period has been that we haven’t scored that many goals but today was good because we kept a clean sheet and the opposition had no real opportunities. We’re happy about that and we did have a few chances to score so we’ll take this nil-nil and build towards the next game,” he added. The Football Ferns will now meet Thailand again in the second match of the tour on Tuesday 28 November at SCG Stadium in Bangkok from 11pm (NZT).